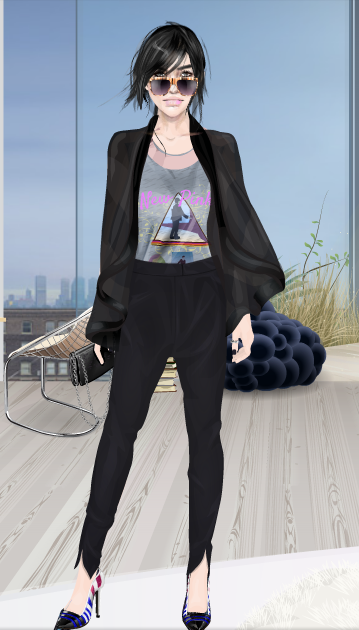 For a long while I missed posts that captured looks, suites, or maybe designs of some of Stardoll's most gifted users. What's on: PPQ Zegina Jacket, Callie's Picks Pink Metal Collar Necklace, Vinyl Vintage Band Tshirt, Runway Armani Style Resort Purse, Killah Byrd Shades, Melbourne Minimalism Tribute Low Waisted Trousers, The Jet Set Striped Acrylic Stilettos, and Inspired by Jimmy Choo Tribute Faux Croc Metallic Heels. That necklace and the Tshirt were well-made for each other, don't you agree? Mayly1968 sparked my attention while I was scrolling down the Spotlight in order to find anything inspiring. What caught my eye right away were the hair design, and the facials. However, it was not only the look that mattered, but also her suites, which are inspired by all sorts of places she visited in real life! I personally find her spectacular.